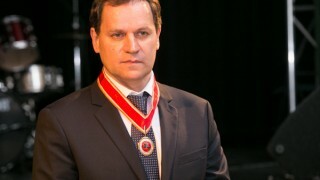 The MEP and a long-term leader of the Electoral Action of Poles in Lithuania (AWPL), Waldemar Tomaszewski, received the title and the badge of an Honorary Citizen of the Vilnius district from Maria Rekść, the Mayor of the Vilnius district during a gala ceremony in the Polish Community Centre in Vilnius. “It’s a wonderful title because who wouldn’t want to be a citizen of a district developing as dynamically as the Vilnius district” – the Polish ambassador in Lithuania Jarosław Czubiński stressed while he was congratulating Waldemar Tomaszewski. The ceremony began with artistic performances during which, similarly as during the whole ceremony, national and patriotic symbols were dominating. A surprise gift from the Vilnius district was the film “Bóg, Honor, Ojczyzna. Wielki zwykły człowiek” (“God, Honour, Homeland. A great ordinary man”) telling a story of the activity of AWPL’s leader through the perspective of his co-workers. The materials used in the film were collected by the Polish Audiovisual Library in Vilnius, thanks to which the elderly got a moment for recollection and agitation, and the youth could meet the Waldemar Tomaszewski as he was at the beginning of his activity. The ceremony of giving the Honorary Citizenship of the Vilnius district congregated plenty of friends and co-workers of Waldemar Tomaszewski’s in the Polish Community Centre. The participants of the ceremony included representatives of AWPL and ZPL, Šalčininkai and Švenčionys disctricts, priests, and family. Polish representatives were also present: the Polish ambassador in Lithuania Jarosław Czubiński, as well as his predecessor Janusz Skolimowski, and the chairman of “Wspólnota Polska” (“Polish Community”) association Longin Komołowski. The Council of the Vilnius District Munincipality has given the title of an Honorary Citizen of the Vilnius District to the leader of the Electoral Action of Poles in Lithuania, MEP Waldemar Tomaszewski, on 27th March 2015. The initiative to give Waldemar Tomaszewski the title of an Honorary Citizen was presented to the Vilnius District Munincipality by local communities including the inhabitants of Buivydžiai, Lavoriškių, and Sužionys. Previously, these titles were given to three priests – pr. Józef Obremski, pr. Antoni Dziekan, and pr. Dariusz Stańczyk, as well as a long-term chairman of the “Wspólnota Polska” Association, a great friend of the Vilnius region, professor Andrzej Stelmachowski.